Eugene and I adore Italian food. Authentic, delicious Italian food made with the best and purest ingredients and with all the verve, passion and energy that the finest Italian chefs bring to their creations. So it is with unalloyed happiness that we have been regular patrons of Magica Roma for years and years. 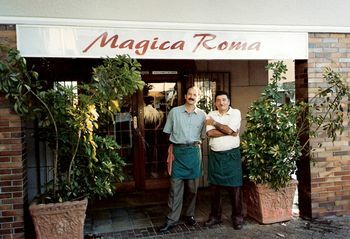 Magica Roma Ristorante Italiano at 8 Central Square, Pinelands in Cape Town, is proudly Italian. Everything about it is Italian, from the owner/chefs Ezio De Biaggi and Franco Zezia, to the food that emerges triumphantly from the kitchen. 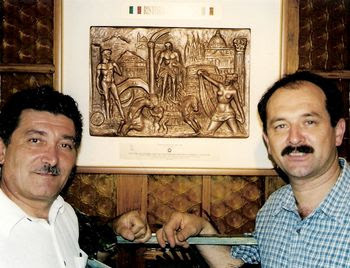 Our hosts were named Cavalieri Del Lavoro (Knights) by the President of Italy Dr. Scalfaro, for creating a completely genuine Italian restaurant outside Italy. 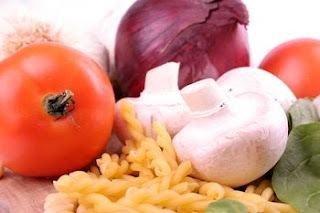 Having been accorded this signal honour, they are honour bound to maintain the finest tradition of Italian cooking using only the best ingredients. Wine Magazine has, since the year 2000, included them each year in the top 100 restaurants in South Africa. 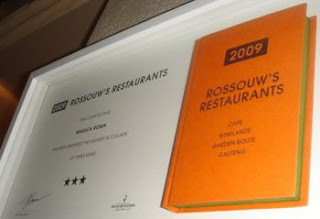 Rossouw's Restaurant has awarded Magica Roma 3 stars. In addition to all of this, there are numerous glowing write-ups and mentions from all over the world. On arrival, there is always a warm welcome. Generally either Ezio or Franco pops out of the kitchen to greet one with gracious Italian flourish. The kitchen is always busy, but somehow they find time to be hospitable. It is always a warm personal greeting as they have known most of their customers for years. Incidentally, a newcomer remains a newcomer for about 5 minutes. That is the time that it takes for them to get to know you. They have amazing memories. They ask after your family, remember what your favourite foods are and exactly how you like it prepared. It really is more like visiting an Italian home than a restaurant. The decor and furnishings are chic. Chairs, comfortably upholstered banquettes and tables dressed in crisp white linen cloths and napkins with gleaming wine glasses standing to attention, fill the rooms. The knowledgeable and wonderfully efficient young waiters and waitresses are neatly and professionally dressed in black. They manage the needs of the diners with an easy efficiency that allows for a completely relaxed atmosphere. But, at Magica Roma, it is the food that takes centre stage. Both Ezio and Franco learnt the fundamentals of their craft in their grandmothers' and mothers' kitchens. They both have a long history as highly respected restaurateurs and chefs in South Africa and were well-known to many of us before they joined forces. The menu features delicious hot and cold antipasti, prepared in a way unique to Magica Roma. The main courses include seafood, fresh fish of the day, veal, a speciality of the house, and wonderfully prepared beef and lamb and chicken. There is every pasta and pizza you could think of because the approach of our hosts is that they will make anything a customer desires. I don't only mean any pizza or pasta, I mean anything. If you have a special favourite, they will source the ingredients and create the dish and serve it in impeccable manner. There are delicious desserts on the menu. You may like to try a superb tiramisu, a decadent spumoni or any one of the temptations on offer. There is a delicious home-baked cheesecake. Something to enjoy with your post-prandial coffee. A wonderful cross-section of people frequents the restaurant. Captains of Industry rub shoulders with ladies and gentlemen that lunch. Early in the evening it is not unusual to see families with young children enjoying a meal together. Many that dine there never request a menu. Instead, they are brought great platters of wonderful food, reflecting whatever is fresh at the market that day. The platters keep on coming and at the end of it all, they have eaten like Mediterranean royalty. A full wine list provides wines to complement the meal and some regulars have their own private bins kept specially for them. On a recent visit to Magica Roma for lunch, it was suggested that we share a platter of some of our favourite things and naturally they knew exactly what these were. What a wonderful sight it was! Beautifully presented on a large oval platter, was Parma Ham, Vitello Tonato, grilled baby calamari, fresh asparagus with parmesan cheese and a gorgeously dressed Caprese salad with tomato, buffalo mozzarella and avo. Also in this heavenly feast was eggplant, prepared the way I love it, sliced paper thin and lightly grilled and annointed with a drizzle of olive oil. To round it all off, toasted bruschetta with cheese and tomato, a sort of a mini-pizza. Oh my goodness, what a feast! Succulent and oh so delicious!. We ate every morsel. But more was still to come. Another platter arrived, tagliolini served with two different sauces. One with mini Rosa tomatoes gently cooked with fresh basil and oregano in a light creamy sauce with just a hint of garlic and chilli. The other, sautéed chopped mushrooms with a good dollop of white truffle oil. Food for the gods! A side dish of the salad of the house, Insalata della Casa, completed the feast. This salad is an absolute favourite of mine, mixed salad with avocado, olives, feta chees, garlic and mozzarella. How wonderful to have the choices made for us. "Don't worry, I'll make something you like." Any regular at Magica Roma will know exactly what that means. 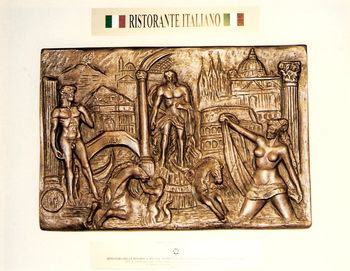 Back Chat hopes that you too will discover the joys and delights of Magica Roma and wishes you Buon Appetito !! Magica Roma is open every day for lunch except Saturday and Sunday. They are open for dinner every night, except Sunday. They cater for functions for which there is a special set menu with many options. What I love best about these two incredible restaurateurs is the "you dont want a menu, we feed you" attitiude they have. I dont get there nearly often enough! Thanks for the reminder that we do have some truly great classic restaurants in Cape Town. Thank you for your super comment. Your affirmation is a great compliment to me and to Magica Roma.